Grant, we pray, O Lord, that we may be helped by the prayers of the Priest Saint John Damascene, so that the true faith, which he excelled in teaching, may always be our light and our strength. Through our Lord Jesus Christ, your Son, who lives and reigns with you in the unity of the Holy Spirit, one God, for ever and ever. St. John Damascene was a learned theologian who carefully gathered together and transmitted to us the teaching of the Greek Fathers, and is thus one of the most trustworthy witnesses to oriental tradition. He also wrote many liturgical hymns still in use today. St. John Damascene died in 749. Leo XIII proclaimed him a Doctor of the universal Church. According to the 1962 Missal of St. John XXIII the Extraordinary Form of the Roman Rite, today is the feast of St. Peter Chrysologus, bishop, confessor and doctor whose feast in the Ordinary Form of the Roman Rite is celebrated on July 30. It is also the feast of St. Barbara, a virgin and martyr who died at Nicomedia about 235. The excellence of Adam and Eve's natural endowments. John of Damascus or Damascene, the last of the Greek Fathers, was one of the principal defenders of the veneration of images against the Iconoclasts, who condemned this practice. When John was born, Damascus was under the jurisdiction of caliphs, but Christians were allowed to hold high offices. John's father was chief revenue officer of the caliph and a sterling Christian. He entrusted his son's education to a monk, Cosmas, who had been brought from Sicily as a slave, and who schooled the young man in theology, the sciences, and poetry. John succeeded his father in office, and while living at the court gave an example of a model Christian. But he had set his sights higher, and after resigning his office he became a monk at St. Sabbas monastery near Jerusalem. Here he spent his time writing books and composing hymns. When Leo the Isaurian issued decrees against the veneration of images, John took up the challenge and wrote treatises defending this ancient practice. At this time the Patriarch of Jerusalem, desirous of having John among his clergy, ordained him priest and brought him to Jerusalem. After some time, however, John returned to the monastery and devoted the rest of his life to writing. His most important work is his Fountain of Wisdom, in which he compiled and collated the teachings of all the great theologians before him; this is the first attempt at a Summa Theologica, a summary of philosophy and theology, that has come down to us. John's writings are a rich treasure of ancient traditions, and are held in high esteem. Pope Leo XIII declared him a Doctor of the Church in 1890. St. John was such a great orator that he was known as Chrysorrhoas ("golden-stream"). He was the last of the Greek Fathers of the Church, and the first of the Christian Aristotleans. He also adapted choral music for use in the liturgy. His eloquent defense of Christian images has given him the title of "Doctor of Christian Art." 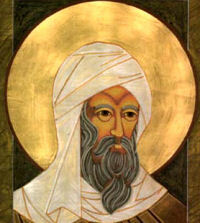 St. John Damascene has contributed much to the Church through his writings. Read all or part of his most famous work, Exposition of the Orthodox Faith. Check out some ideas for Celebrating the Feast of St. John Damascene. Learn more about his life and writings. He was famous for his opposition to the heresy of the Iconoclasts: you could find out more about this heresy. Learn more about Catholic Sacramentals which include statues and images. Purchase A Handbook of Catholic Sacramentals by Ann Ball. St. John Damascene was made a Doctor of the Church for his efforts to defend the faith, learn to defend the use of religious pictures and objects to your Protestant friends. Barbara (from Nicomedia) was the daughter of a pagan noble who worshipped false gods. Because of her striking beauty, her father enclosed her in a tower to hide her from the snares of men. Barbara vowed virginity, and during an absence of her father had a third window added to her quarters in honor of the Blessed Trinity; at the same time, she also adorned her bath with the sign of the holy Cross. Upon his return her father was so angered over these changes that a miracle was needed to save her life. She was presented before the magistrate, subjected to much torturing, and finally her own father wielded the sword that severed her head. Immediately God's vengeance struck him dead. The holy virgin is highly honored both in the East and the West as patroness of artillery men and of miners. She is especially invoked for preservation from sudden death. She is one of the "Fourteen Holy Helpers." In certain parts of Europe, the so-called "Barbara branch" is brought into homes today. It consists of a small cherry twig that is set in water and should blossom on Christmas eve. The custom is deeply Biblical and liturgical. "The bud from the root of Jesse and the flower from its root" is Jesus Christ, whom we expectantly await during Advent and who will blossom forth as a flower at Christmas. Patron: against death by artillery; against explosions; against fire; against impenitence; against lightning; against mine collapse; against storms; ammunition magazines; ammunition workers; architects; armourers; artillery; artillerymen; boatmen; bomb technicians; brass workers; brewers; builders; carpenters; construction workers; dying people; explosives workers; fire; fire prevention; firefighters; fireworks; fireworks manufacturers; fortifications; founders; geologists; gravediggers; gunners; hatmakers; hatters; lightning; mariners; martyrs; masons; mathematicians; military engineers; milliners; miners; ordnance workers; prisoners; safety from storms; sailors; saltpetre workers; smelters; stone masons; stonecutters; storms; sudden death; Syria; tilers; warehouses; watermen. Symbols: cannon; chalice; host and paten; tower with three windows; tower and palm; monstrance; peacock feather; torches; fortress; spears; crown; book; sword; palm of martyrdom. Often Portrayed As: princess in a tower with either the palm of martyrdom or chalice of happy death; woman holding a tower or feather; woman trampling a Saracen. Be sure to look at Celebrating for the Feast of St. Barbara in the Activities section. See also Painting Angels, Saints and Their Symbols for a description of St. Barbara's symbols. Have a St. Barbara's Party, Syrian Style. Short Biography and History by Father Weiser. Read this Life of St. Barbara. Read about the German custom of St. Barbara's Twig, where every member of the family puts a small cherry or peach branch into water so that it will blossom on Christmas. If you have a young lady in your home desiring marriage, the custom of St. Barbara's Cherry Twigs will have St. Barbara pick the right husband for young unmarried girls. An alternative idea to this custom would be forcing Amaryllis or other bulbs to bloom for Christmas. Start the bulbs today! St. Barbara is the patron of artillerymen. Offer your rosary or say a prayer for all our enlisted men and women who are in harm's way. This page provides the Legend of St. Barbara and the explanation why she is the patron of artillerymen. Read the Ballad of St. Barbara by G. K. Chesterton. Read about Barbórka, Miners Day, which is celebrated in Poland and other European countries.